I ended up going down a YouTube rabbit hole the other day. I was watching reviews about electric motorcycles, (Zero SR for example) and it got me to thinking. Given the size and stability of the Spyder, does anybody think it would make a good platform for an electric three wheeler? My opinion; I think it is a great platform. It should be large enough to have enough battery storage for some impressive range and since we don't need to hold up the weight of batteries, you could have a decent size bank in there. Would I buy one? I think so, if there was a way to fast charge while out on the road like Tesla does with their Supercharger charging stations. BRP built a prototype a while back; we saw it during the tours at Homecoming. IIRC they said to get any decent range it would have to be extremely heavy and they couldn't actually get enough battery in it. Yup... saw the one at the homecoming. Talked to the engineers and those who had driven it. They had to pull the DPS because it pulls too much power. We talked about having a trailer with extra batteries in it.. but you're really fighting weight vs. battery power and the numbers currently don't work for a production model. Batteries need to be lighter and cheaper. 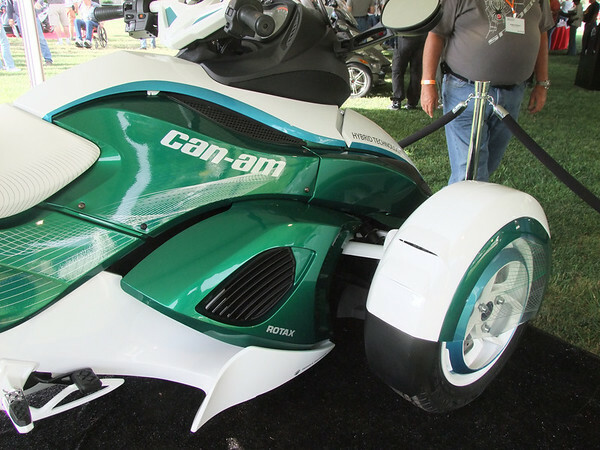 If BRP could build one that got at least 150 miles to a charge, direct drive, and still kept the F3 look/style, I'd buy. God bless those who serve/served our country! BRP had an Eco version of Spyder. They got government (Canadian) funding for the project. We speculated about it back a few years ago. I am thinking slim chance. I don't see people buying a $40K Spyder with low miles between re-charges. I will see if I can come up with a photo from the archives. I did an April Fool with it twice. A reprint shown below. PS. I said I would not repeat the April Fool. BRP announced today that the new Can Am Hybrid Roadster would be available in June of 2017. It is a combination of an electric powered unit with a small back up Rotax engine. Mileage on the electric charge is said to be a hundred miles plus (no typo here) and another hundred and twenty five miles on the rotax. Last edited by ARtraveler; 10-08-2018 at 04:34 PM. They floated the concept back in 2011 with a hybrid version. This time around, I think they should test market an E-Ryker version using the cheaper base platform - The Ryker would be ideal; riders who won't need a lot of range. Last edited by asp125; 10-08-2018 at 04:24 PM. the picture I showed above was rumored to be a plastic shell only--NO MOTOR. I think it would make an excellent platform,infact I think it would make a great hybrid platform. And yes I would buy one. Some of the stories I read from back in 2016 indicated a range of 105 miles on their prototype. I would like to think that current battery technology has improved over the last 2 years. Maybe not to the point of 200 mile range without weighing in like a Chevy Suburban but it has to be somewhat better. Not sure how they could get around the DPS and it's draw. Maybe a hydraulic system with a small pump driven off the same motor as the main drive when in motion and an electric pump for when stationary. I wonder how close to reality is this video? I think in order to be a viable vehicle for purchase an electric/hybrid Spyder would need to get at least 150 miles per charge and the recharge time would have to be in minutes, not hours. The Tesla super charge station is a good idea, but how many of these are going to be found in Nowhere, USA when you need them. No, this will have to be a vehicle that can recharge in minutes from a standard electrical outlet, or be capable of recharging itself, before I would consider purchasing one. Lets face it, with current battery limitations in place and cost projections an electrically powered Spyder is going to be expensive and will no doubt be limited to a few niche markets/customers, mainly urban in nature. The enticement for me isn't an electric vehicle per se, it's the fact that an electrically powered vehicle has unlimited speed potential which equates to big time fun while still having the ability to be relatively economical to operate. The downside is that BRP will no doubt put a severe cap on how much "fun" someone will be allowed to pursue with their electrically powered Spyder. There is also no doubt in my mind that the future is bright for electrically powered vehicles of all types, but I fear their full potential will not be realized for many, many years when batteries are much smaller, lighter, cheaper and more powerful and offer much greater range than what is available today. Until that time arrives and God willing I live so long, I will rely on fossil fueled vehicles to get me to and from while having some fun at the same time. Problem I see is that currently advancements in the EV field are that rapid and far ranging by the time something comes to market it's old tech from the get go,like all electronic stuff.Got to start somewhere though but it won't be my money subsidising the roll outs just yet.I'm all for saving the planet but don't have a bottomless pit of resources to help out.Needs to mature a bit more for the majority I would say. Electric vehicles are the CFL's of light bulbs. The idea is good at heart but in reality they don't work well for most consumers. It's a shame we've wasted as much time on them as we have really. Disagree. Electric powered vehicles are the future and will become the norm. Now, how that power is generated to make them go is another thing altogether. You see, even if it was a fuel cell vehicle... it's still electric. All the future technologies will be using an electric drivetrain. Some major players are changing to all electric vehicles within 10-15 years. The Honda NeoWing prototype is hybrid. Hybrid seems to be the most viable method with onboard charging if possible and brake energy recovery. The added ability to plug in while stopping for a snack at gas stations with power setups helps too. At homecoming I talked with the engineers about it. They said it really came down to cost. They have batteries that would give them the range they wanted, but they were very expensive to produce. They thought the retail price would be over 70k USD for a production model. That means the market would be very limited if any at that price point. When the technology gets to the point that they can build an Electric Spyder for the same price or only a few thousand more than the gas version they will sell one. When it takes four or five long days to traverse the Continent with our current gas-powered vehicles; how long will it take to manage the same trip using battery power? While electrically powered vehicles may prove to ultimately be the future: it's HOW the power is generated, that will be the breakthrough. Egads, who among us is gonna fork out $40K for this machine? For the few who can and will, not worth the production for BRP. Also, for that price point, you can buy two hybrid Prius cars that gets 70 mpg and $ left to buy more regular fuel. Not dissing the proto type Spyder, jus sayin.